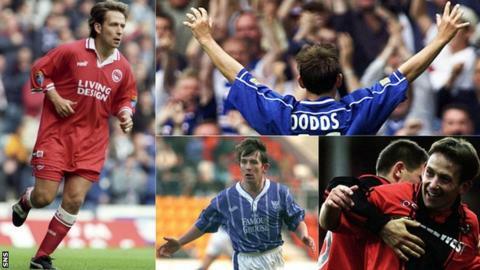 BBC Scotland pundit Billy Dodds played for each of the four clubs who will contest the Scottish Cup semi-finals this weekend. Dodds scored in the 2000 Scottish Cup final as Rangers beat Aberdeen 4-0 to secure the silverware. The forward served St Johnstone, the Dons and Dundee United before his move to Ibrox, which preceded a return to the Tangerines. And here, Dodds predicts who will come out on top in this weekend's last-four matches at Ibrox Stadium. "The game being at Ibrox is going to bridge that gap between League 1 and the Premiership and make it a little bit closer. The Rangers fans - I think 35,000 are going to be there - will make it a little closer as well. "But Rangers will have to play a whole lot better than they did in the Ramsdens Cup final against Raith Rovers or Dundee United could win this one by a couple of goals. "Surely after losing 1-0 after extra-time against Raith the players are going to have a bit of an edge about them. Are they good enough? Well, that remains to be seen. The Rangers players now must show their fans they've got a bit about them. "Rangers have a lot to prove but United, with the season they're having and the flair players they have, would be odds on favourites for me." "I think you have to make Aberdeen slight favourites because of the season they're having, the players they have at their disposal and the way they won the semi-final of the League Cup against St Johnstone. "But that game was a lot closer than a lot of people thought. St Johnstone had chances and their team spirit is magnificent as well. "I would have to say Aberdeen will get through the tie but it'll be a lot closer than people think. "A lot of people would fancy a wager on St Johnstone because they are due to win a semi-final but I still think Aberdeen will make it."